Greetings from the ‘Falls here, and today I have special post to share with you, a guest interview with fellow Severed Press author, Alister Hodge. Alister currently has three titles under his belt with Severed, ‘the Plague War’ series: apocalyptic thrillers set in his native Australia. For those of you who are into the Zombie Apocalypse genre, these will be right up your alley. If you’re not – grab them anyhow. With his background in emergency services, you’ll find Alister knows his way around the topic of emergency situations and you’ll find these very engaging tales told in a clean, compelling prose. AH: I live in Sydney with my wife and two daughters. I’m a keen traveller, loving to experience new foods, sights and cultures. I’ve spent time exploring parts of Africa, the Middle-East, Asia, South-East Asia and Europe, and it was through travelling and work in the UK, that I had the good fortune of meeting my beautiful wife, Lee. Together, we have two daughters that I’m extremely proud of as they grow to be caring, active girls. Outside of writing, I also work full-time as an Emergency Nurse Practitioner in a busy Sydney Emergency Department. RS: Are there any life experiences that have influenced your writing? AH: By working in the Emergency specialty, both in the UK and Australia for over seventeen years, I’ve come in contact with humans at their best and worst. I’ve treated patients during medical emergencies, seen death, trauma, life changing illness, and then the resulting grief and loss experienced by families. It’s an environment that reinforces the fact life isn’t always fair. Someone might be a good person, but still have their life cut short in a car accident, or never smoke a cigarette in their life and develop lung cancer. In such environments, the usual facades people put up are stripped away, and it’s a privilege to work with people in what can be the most stressful and difficult time of their life. I think this is reflected in my novels where I favour an almost grimdark style of writing. My characters have flaws, and face challenges. There is evil, and unfortunately the worst is often found in the minds and actions of other humans and what we do to each other. When I describe blood, gore and agony, or life and death situations, it comes from personal experience. I know how the crunch of a broken bone feels under hand, what the pattern of blood looks like on the ground after it squirts from a severed artery. I’ve experienced the stress and self-doubt that must be overcome during a medical emergency, and also witnessed the grief and distress of family members confronted with the loss of a loved one. These are unforgettable experiences that can’t help but leave a mark on my subconscious and writing. RS: Your Plague War series is published through Severed Press, can you tell us what inspired you to write the trilogy? 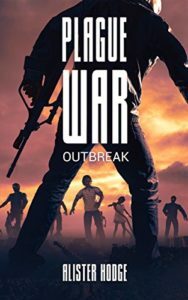 AH: I gained inspiration to write the Plague War trilogy from reading ‘World War Z’ by Max Brooks, alongside a love of grimdark fiction. My initial desire, was to create an story that would track a set of real to life characters in an Australian zombie apocalypse, from an infection-based outbreak of violence and collapse of society, through to a military led retaliation that leaves the Australian people, government and state relationships forever changed. I also wanted to see what such an event would be like through the eyes of different parts of society, and explore the perspectives of civilians, police, health workers and armed forces as they tackle the destruction of the world about them. RS: Do your characters seem to hijack the story or do you feel like you have the reigns of the story? AH: When it comes to writing style, I wouldn’t class myself strictly as either a ‘pantser’ or ‘plotter’, as I tend to do a bit of both. I prefer to start with a rough outline of the novel, or at least around ten chapters. I think the main reason for this is to help me relax enough to just start writing. The characters themselves are obviously one of the most important aspects of any story, and as they develop and get fleshed out, I find they do influence the novel in ways I didn’t expect. On numerous occasions I’ve had to ditch planned chapters, as it turned out my character interacted with the scene in a different way than expected. I think it’s important to allow this to happen, otherwise, you risk the characters becoming mere props to link action sequences together which inevitably rings hollow. 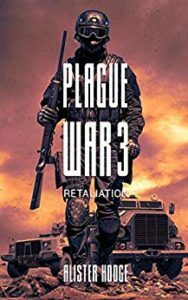 RS: Who is your favorite and least favorite character from the Plague War series and why? AH: My favorite character from my first three books is a teenager named Erin. She’s a tough kid, that despite suffering the loss of loved ones and surviving hideous violence of the apocalypse, refuses to take a backward step. She’s probably the only character of the series that I couldn’t bring myself to kill off. I’ve also enjoyed writing some evil characters, however, Chris from ‘Plague War 3: Retaliation’ was a different story. Chris was misogynistic, arrogant, sadistic man, and I always felt a little sullied on leaving his headspace. Have you written any other books that are yet to be published? AH: I have two books awaiting publication this year. ‘The Viperob Files’, has been contracted to Crossroad Press. It’s a Young Adult, science fiction / horror / dystopian novel. The Viperob Files: In 2194, the excesses of the Petroleum Age has warmed the Earth, raising sea levels, causing massive social upheaval, and hideous mutations within the animal kingdom. Ethan lives on an island owned by Viperob, a powerful corporation that constructs military drones for the Australasian Army. As the sixteen-year-old child of a Viperob employee, Ethan’s education includes combat training to ensure the corporation has a private army to protect its own assets in time of war. When his father, Nikolai, discovers a plan to hand control of the military’s AI drones to a foreign power, he is murdered to suppress the information. Ethan, however, has been left a copy of the files in question. To bring this evidence to the Australasian Army and prevent a possible invasion, he will need to outwit a private security force led by the psychopathic Lieutenant Harris, survive mutated predators and escape Viperob’s island complex. The Viperob Files takes a similar world setting of Paolo Bacigalupi’s The Windup Girl, and mashes it with the action of James Dashner’s The Maze Runner, as a trio of friends seek to escape the control of the Viperob Corporation. The second book, named “The Cavern” is contracted to Severed Press. It’s a creature horror, with a caving / cave diving setting, so there’s plenty of claustrophobia thrown in as well to heighten the tension. The Cavern: In a dying opal-mining town of Pintalba in the Australian outback, a creature known as the ‘Miner’s Mother’ has come out of hibernation to hunt the town’s people. Living underground, it moves between connected caves and disused mines, and has the ability to camouflage / shape-change to mimic humans that it has eaten, using their appearance to lure subsequent victims to their death. When a group of cavers seek to explore the a newly discovered cave system in Pintalba, they will be forced to fight for their lives. Alister Hodge is a Sydney based author, writing within the genres of horror, science fiction and young adult. He is also an Emergency Nurse Practitioner and a Clinical Lecturer at the University of Sydney. As a mental break from providing healthcare in a busy Emergency Department, Alister leaves behind the everyday traumas and horror of the real world, by creating new ones for post-apocalyptic and dystopian landscapes. 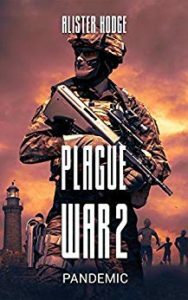 Alister’s debut Plague War series, including ‘Plague War: Outbreak’, ‘Plague War 2: Pandemic’, and ‘Plague War 3: Retaliation’, are published by Severed Press. His upcoming release, ‘The Viperob Files’, will be published by Crossroad Press in 2019. 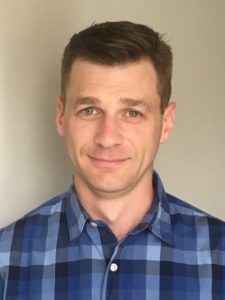 Aside from fiction writing, Alister has authored numerous journal and textbook publications, and is the co-creator of an app to support triage nurse development in Australia and the USA. Writer, 3d artist, Designer...lurking somewhere in the Hudson Valley. Next book signing: mark your calendars!